An unlikely scene played out this week in downtown Dubai as hundreds of South Asian migrant construction workers building a luxury apartment high-rise went on strike to demand more money. About 400 of the workers who struck Tuesday (March 10) returned to work on the Fountain Views project Wednesday night after discussions with labor officials, according to reports. Risking deportation, hundreds of migrant construction workers complained of inadequate compensation for overtime work and a lack of incentives, while blocking traffic in downtown Dubai Tuesday (March 10) morning. 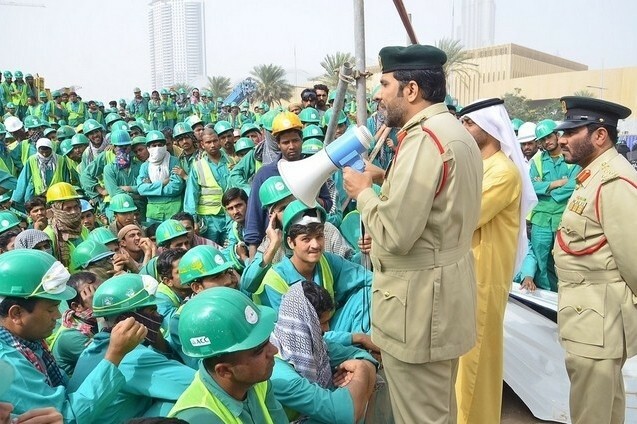 Clad in hard hats and construction uniforms, hundreds of strikers temporarily blocked roads Tuesday morning about 9 a.m.
Dubai Police said they had controlled the demonstration within an hour, making no arrests, reports said. 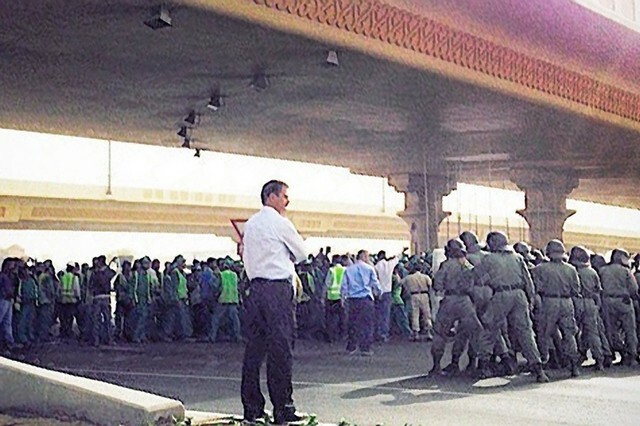 Such protests are unusual due to the visa sponsorship system (or Kafala) in effect in the United Arab Emirates. 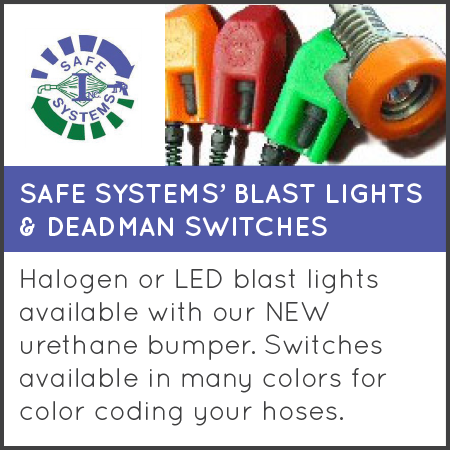 The system ties a worker’s legal status in the country to a sponsoring employer, the Associated Press reported. The policies also restrict an employee’s ability to change employers. The workers on the Fountain Views development—a project by Dubai-based Emaar Properties—objected to a number of pay issues, including inadequate compensation for overtime work and a lack of incentives, reports said. Millions of workers come from countries like Pakistan, Nepal, Bangladesh and India to provide the manpower to build mega-construction projects throughout the region, according to the AP. Riot police (at right) were also called to the scene, but no arrests were made. Human Rights Watch estimates there are more than five million low-paid migrant workers in the UAE alone, the AP reported. 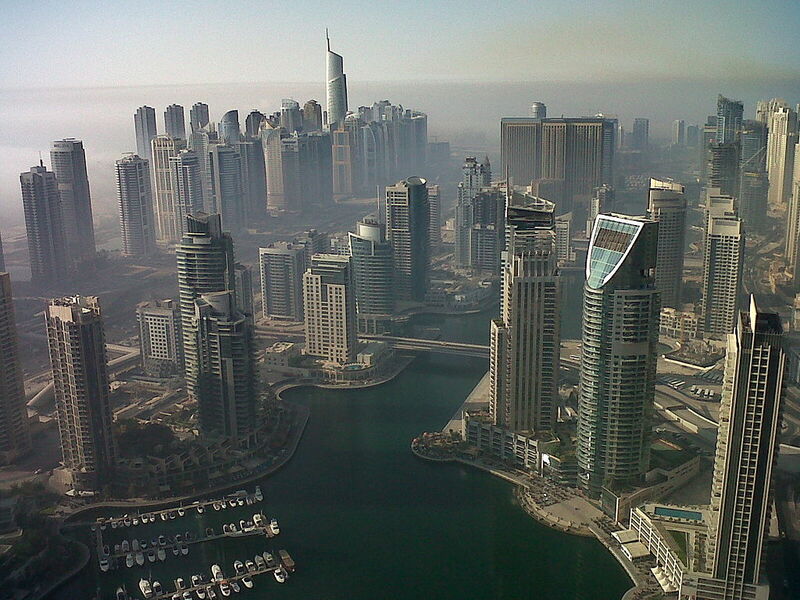 The UAE is one of the top 10 richest countries in the world. In a statement, the general manager of Arabian Construction Company, which employs the 3,200 workers on the Emaar site, said the company took the rights of its employees “very seriously.” The ACC has operated for nearly 50 years throughout the Middle East. “Our system is computerized, and workers punch in and out the number of hours they work, and this cannot be faked,” Hassan Auji told The National. About 3,200 workers are building the Fountain Views in downtown Dubai, near Burj Khalifa, the world's tallest building, and The Dubai Mall. Emaar Properties is the developer on all three projects. Work conditions at the Fountain Views project do not currently call for extra incentives, Auji told the newspaper. The construction company does not intend to discipline those employees who led the strike; however, if they “instigate workers or repeat an unlawful action like blocking the road, then action will have to be taken and they can be deported, as per the law,” Auji said. The $140 million Fountain Views project includes 788 apartment units and is expected to be completed by December. It features three towers of at least 58 stories each in downtown Dubai, according to project details. Adrian Smith + Gordon Gill Architecture and Dewan Al Emara Architects & Engineers serve as design consultants on the project. Emaar Properties is a global property concern with a vast portfolio of projects in the Middle East, North Africa and Asia. The company developed Burj Khalifa in Dubai, the world’s tallest building, and The Dubai Mall, the world’s largest shopping and entertainment venue.